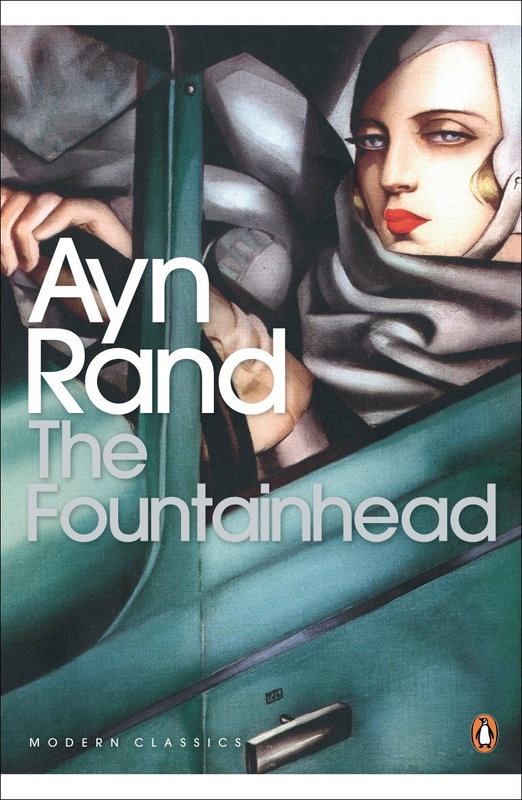 I’ll begin this review with a confession: I have never read The Fountainhead, Ayn Rand’s 1943 novel that serves as the basis for King Vidor’s 1949 motion picture of the same title. Honestly, I’ve better things to read than Rand’s rather hefty tome, 700 pages in length, and I’m sure it isn’t much different to the film, considering Rand wrote that, too. 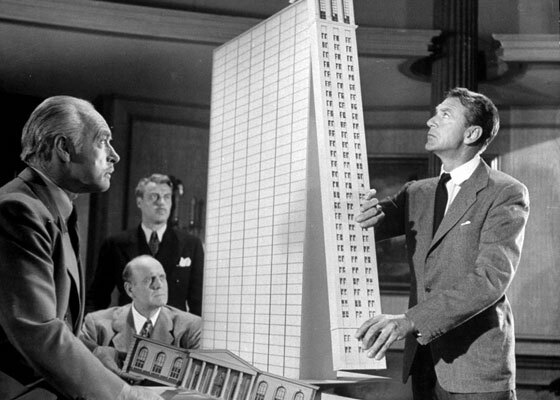 The Fountainhead is an oddly entertaining film experience, despite being saddled with a screenplay that is the ideological equivalent of Swiss cheese. 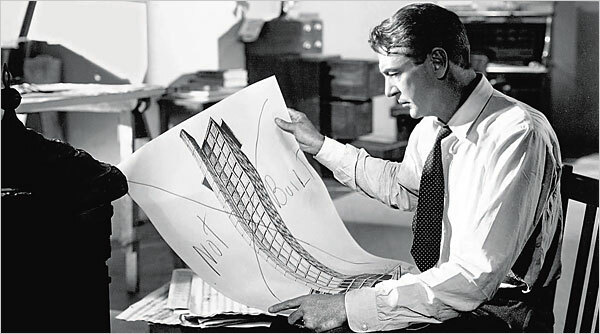 Here’s the skinny: Howard Roark (Gary Cooper) is a fiercely idealistic architect, an individualist who defies contemporary trends in architecture (and some might say good taste and all semblance of practicality) to design buildings that are … well, unique, to say the least. In between scribbling blueprints for structures that might be termed most politely as avant-garde, Roark pontificates (often with a severe degree of absurdity) about his own sacred individualism, the ostensible evils of collectivism, and his general hatred of the masses. Against the tide of public sentiment, Howard Roark is going the design buildings his way, or die trying! 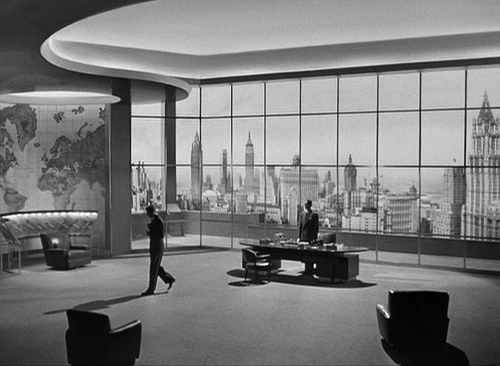 The Fountainhead involves some kooky-looking skyscrapers, criminal activity, steamy romance, not to mention a somewhat confused-looking Gary Cooper delivering an extremely lengthy courtroom speech. Ayn Rand calls collectivism “parasitic”, but then what does that make capitalism? Capitalism IS a collective agreement, one made between workers and employers. Let’s see the Howard Roarks of the world achieve anything “to the best of their ability” without thousands of worker bees and drone ants scurrying about the place, working for crumbs while the Howard Roarks reap the big fat dough. Howard Roark also bemoans the notion of working for no payment as being akin to slavery, forgetting that people commonly perform tasks for no payment, either out of necessity or enjoyment, sometimes both. Roark cannot fathom for even an instant that all those workers employed to turn his blueprint dreams into concrete realities might well be seen as slaves, regardless of the fact that they are being paid for their endeavours (on the notion of waged slavery — see my comments from Le Cinema Dreams above). Countless other words and actions from Roark neatly contradict the architect’s ramblings about the sacred rights of the individual – far from being any sort of libertarian, Roark comes across as a tyrant and a bully – but I’ll leave you to discover the more insane manifestations of Roark’s muddled mind for yourself. Still, for all the head-shaking that is to be had at the expense of its core values, for all the hypocrisy of its hard-headed protagonist, The Fountainhead is a film that I recommend most heartily, must-see material for fans of classic film noir. The romantic chemistry betwixt Gary Cooper and Patricia Neal (who thereafter embarked upon an affair – Cooper had been married to Veronica Balfe since 1933) positively sizzles – in others words, every time Cooper and Neal clinch, they’re not acting, but cheekily flaunting their real life – and socially taboo – affection for each other before the eyes of audiences all over the world. The film is also blessed with some rather handsome black and white cinematography – it’s the type of motion picture that simply wouldn’t have worked anywhere nearly as well had it been in colour. I can almost hear those haters of all things monochromic, complaining that real life isn’t black and white, and that all films ought to be colour. Still, real life isn’t presented on a flat surface framed by a neat rectangular border, either … it’s called art, my friends. I first experienced King Vidor’s Fountainhead inside the building that houses the Australian Centre for the Moving Image (ACMI) – appropriate, considering the building could well have been the brainchild of Howard Roark, if he weren’t a fictitious character. As it stands, you, dear reader, have the chance to behold The Fountainhead inside a much more aesthetically-pleasing venue (so say I, and anybody else with twenty-twenty vision and even the slightest modicum of refined taste), the building that houses The Astor Theatre. The Fountainhead screens as part of a double feature with another film about an obsessive egomaniac given to ostentatious displays of wealth and pride, the landmark motion picture Citizen Kane (1941). This is indeed a rare treat to experience two enduring works from 1940s American cinema in the same evening, so do yourself a favour and behold these treasures in their original 35mm format at the Astor. The Fountainhead screens in a double feature with Citizen Kaneon Sunday May 4 at 7pm.